The avid cyclist I am, I’ve always had a lure towards the suffering of battling up a mountain pass… and of course bombing down the other side! 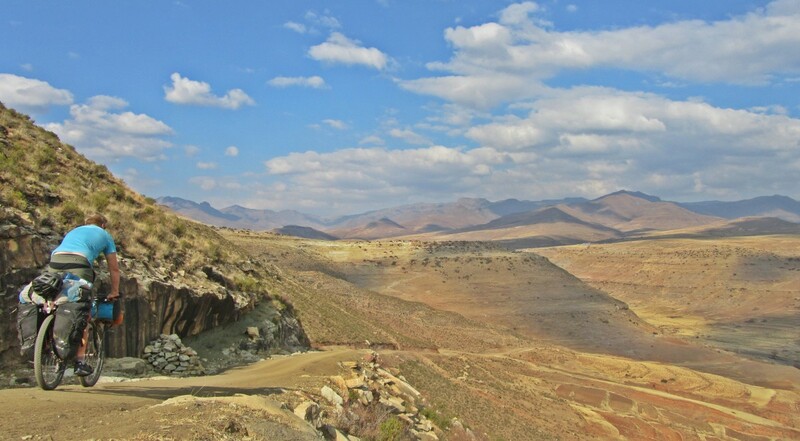 So why Lesotho, well it isn’t known as the mountain kingdom for no reason, it is home to the highest motor-able mountain pass in the whole of Africa, known for horrendous roads or lack thereof and also it is the country with the highest lowest (1400m) elevation in the world. Being a sucker for adventure , I decided its time I should go and explore RSA’s neighboring country. 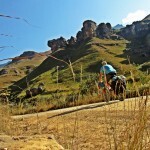 The fact that getting to the border post would mean cycling up Sani pass (33km , with over 2000m elevation gain was an added bonus). Despite all the warnings from EVERYONE I told about my planned journey, either I would freeze to death from being stuck in a snow storm, the snow sometimes gets to knee deep, temperatures plummet to -15 degrees Celcius at night…or I was going to be robbed of all my belongings . Ever being an optimist I just thought to myself no , it cannot be that bad. Read a blog about an American cyclist who loved it…and another who hated it…mmm 50-50… I just had to go and find out for myself. My plan was to explore the Eastern highlands as all the major cities are in the West and there was at the time some conflict, Lesotho’s army fighting against each other? (how obscure) I deemed it much safer to stay in the less populated area…just in-case people were right about their predictions. Everonye told me I should not do it, but chances were 50/50. 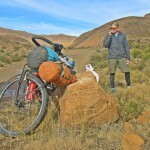 I took the train from Prince Albert (small town in the karoo not far from Cape Town), rode it to Johannesburg, and then another train to Ladysmith. It took some 30 hours, but it certainly was a unique way to see the country side as transport by train(long distance) is in fact quite uncommon in South Africa. 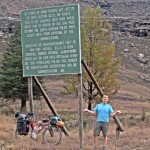 My journey officially started in Ladysmith, north of the Drakensberg mountain range. I knew I was in for a tough time while in Lesotho as the roads are all basically a mountain pass, but the midlands in Kwazulu Natal took me by surprise with its own mountain roads of note and I was not used to the heavily laden bicycle due to all the extra gear(+/- 40kg, gaiters, everything waterproof even a pair of La Sportiva boots in case of knee deep snow etc). It was amazing to see such a beautiful part of my country that Ive never seen before. The people were all very friendly, I was even invited to a 21st birthday party after I got hopelessly lost one day! The alcohol started flowing and the comments also, my favorite was from a elder man, he came up to me and said: “but young man don’t you know the Border war between South Africa and Angola is over? They are not looking for recces anymore!” Which was a huge compliment for me! A recce is the equivalent to the South African special forces, Mike Horn was one back in the day when it was compulsorily for youth to do army service after school. 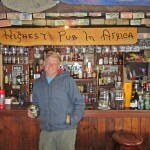 On day 4 I finally reached the border of Lesotho at the top of the Sani pass, and it was immediately apparent Im in a different world! Goats with home made bells clinging on the slopes of the mountains, huts with thatch roof’s and everywhere people were dressed in the countries “national clothes” gumboots and a basotho blanket wrapped around them. I got a pleasant surprise the next morning as I immediately gained even more in altitude all the way to 3240m above sea level, such an quick gain in altitude made life a bit harder with a constant shortage of breath. 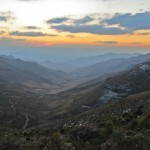 Later the day I made it all the way to the top of Tlaeeng pass, the highest motor able road in Africa! All the way to 3275m above sea level. 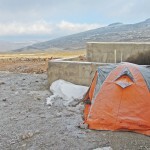 After such a immense effort I decided the camp immediately , it got quite chilly.. -10’degrees Celsius outside! The next morning my bicycle was very light as I was wearing all my clothes I had! 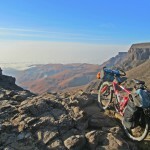 I was cycling on the highest motor-able road in Africa! Days blurred past, the hard work, beauty of the area and the friendly people. My routine consists of sleeping in until 8am, eating breakfast (instant cereal) , studying the maps . By 9am I’m dressed, packed and ready to get the wheels rolling. I made myself the promise to enjoy the trip, stop as often as I like to take pictures or talk to the random strangers next to the road. 1pm I stopped for lunch and then by 5pm I would find a camp spot and 6pm it was dark, I retired to my tent for some reading. Since I was alone I brought a BIG book to last me the whole trip. Some days was quite lonely and difficult and other days was simply wonderful, filled with joy of meeting new people and their friendliness! Usually I would average around 80km in a day, given the terrain I would be very content for those distances. Food wise I was very limited, so as to pack as light as possible. Breakfast was instant cereal, lunch pro-vita biscuits with Gouda cheese, it was cold enough to lug a 1kg block of cheese with me, full of protein and fat for energy! Supper is instant pasta with sauce to which I just had to add water and boil. Of course with my sweet tooth I bought slabs of chocolate as I went… and I also had to fuel my addiction ,coffee! Had some instant coffee luckily in sachets , nothing beats a warm cup of coffee while cozy’ing up in the sleeping bags after a long day of cycling! I must say I was quite impressed by the idea of 2 sleeping bags! The people of Lesotho were amazing! Even if I was just standing next to the road drinking water someone would stop and ask if everything was okay. Their generosity was out of this world, on multiple occasions I was handed free beer from their local brewery, even a plate of delicious trout! It became a theme as each mountain passes condition deteriorated until the Mathebeng pass, which was in all honesty just a bed of stones going at the steepest of inclines, the whole way I was just thinking to myself, I don’t care what anyone says about Sani pass this, this is the most extreme road!!! It took me more than 2 hours to descend the 10km down at the other side. I’m used to going as fast as possible, relishing in exceeding 80kms p/h with the heavy bike, but now I was clutching onto the break levers for dear life!!! Fortunately this was where I had my only crash, nothing spectacular, just hit a ditch at the wrong angle and lost balance. 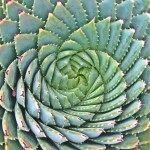 I found it strange as to how erratic my emotions became, the more bizarre the event the more I would just laugh it off. There just is something very appealing to this nomadic type of traveling, having everything you need on the bicycle to survive. 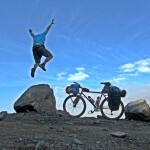 Unfortunately the bicycle’s, which is 20 years old, front pannier broke from all the rugged roads and constant vibration. This is exactly the reason I took the old bicycle for in case I needed to get something welded, it is far easier finding someone who can weld steel compared to aluminium! As soon as I stopped and collected all my gear which was scattered all over the road, a pickup truck stopped and asked if they could help me. He took me all the way to Qacha’s neck and got the bicycle welded for 20 Loti’s (2 USD). By this time I decided I had enough, and made an escape from the Qacha’s neck border post. The only bad thing I can say is, the constant begging for sweet. As in come on? I am pushing my 35-40kg bicycle up a incline of 45 degrees, and some one would stop me and ask for sweets. It is quite a common problem for tourist in Lesotho as French missionaries used sweets to lure the locals to church before. At the border I had the best farewell for leaving the country, it sums up the craziness perfectly. Me: “I’m on a bicycle” , indicating pedaling motion. Official: Stands up and looks outside , “EISH” , he proceeds to sit down and asks me (he was dead serious) “bicycle registration please”. I honestly had the best laughing fit! I ended up with 970km on the bicycles speedometer, for 11 days. I managed to get a lift home fom a town called Maclear in the Eastern cape all the way to Cape Town for only 20USD. Even though I thoroughly enjoyed my trip, coming home was also pure bliss… nothing beats a plate of food cooked for you and a warm soft bed! Sani is considered to be the “starter pass” for Mathebeng. Tlaeeng, Pass of Guns, Mahlasela and Moteng are now a doddle, recently tarred. BTW, Tlaeeng is not the highest motorable in Africa, its 2nd, 1st is somewher in Ethiopia, goes to 4000m.